As written by Steve 'Flash' Juon, and voted on by THE PEOPLE who read RapReviews.com! 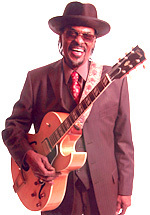 You may not know the name Chuck Brown, or if you do you may think that's what Peppermint Patty calls "good ol' Charlie Brown," but in reality the man born Charles Louis Brown on August 22nd, 1936 in Gaston, North Carolina is "The Godfather of Go-Go" and the driving force behind the sound as it rose to popularity in the Washington, D.C. area in the 1970's. Brown went through a lot of trials to get to that point though. He didn't have a father figure growing up, moved to the D.C. area when he was 6, never finished high school and wound up living on the street by 15. Things went downhill from there as he wound up spending eight years in prison on what he maintains was self-defense, but nonetheless his conviction for death of a man unintentionally sparked his career as a musician, as he wound up trading cigarettes for a guitar in prison. That decision taught him a skill that he would benefit from for the rest of his life, and Brown lived to be 75 years old. He was not an immediate success, as he worked odd jobs as a bricklayer and sparring partner at gyms for a while, but in the 1970's his musical talent made him and The Soul Searchers a success. Without knowing it Brown and his band laid the foundation for a generation of hip-hop samples to come, and "Ashley's Roachclip" is one of my favorites because of the diverse number of parts of it that has been used, each distinct from the others but all incredibly funky. Here is the original for you to cast an ear upon before we present the contenders for "Who Sampled It Better?" There are OVER THREE HUNDRED songs which sample "Ashley's Roachclip" so we may have to do this again at some point down the road. For now though here are four songs for your consideration, and at the end of this post you'll be able to vote for your winner of WSIB. 1.) Eric B. & Rakim - "Paid In Full"
2.) LL Cool J - "Jack the Ripper"
3.) Run-D.M.C. - "Run's House"
4.) Slick Rick - "Hey Young World"
And now place your vote for the winner below! Who sampled "Ashley's Roachclip" by The Soul Searchers better? #WSIB #hiphop Audio available at https://t.co/lRXj5OvUUm to make your vote! We'll have the results next week.